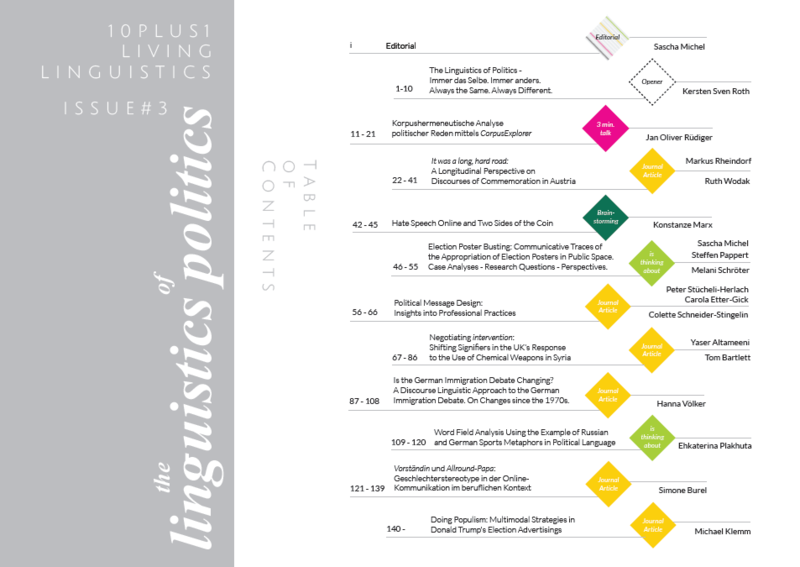 Issue #3 | The Linguistics of Politics | Out Now! Dieser Beitrag wurde unter Allgemein abgelegt am 14/09/2017 von 10plus1. The Linguistics of Politics is the topic of 10plus1’s third issue. This vast field of applied linguistics traditionally encompasses the language of politicians, political parties, institutions and movements from a lexical, pragmatic, and text linguistic point of view (cf. Schröter & Carius 2012; Niehr 2014; Girnth 2015). In recent years, the focus has been extended to aspects of campaigns and campaigning (cf. Pappert 2011; Trent et al. 2011), political frame and framing (cf. Klein 2008; Wehling 2016), discourse linguistic questions (cf. Wengeler 2003; Spieß 2011; Roth 2015), and computer-mediated communication, particularly with respect to social media (cf. Diekmannshenke 2013) and an increasing orientation towards citizens and recipients (e.g. Social TV, cf. Klemm & Michel 2014a). The latter shows that methodologically there is a perceptible shift from a pure focus on analyses of products to a holistic capture of production (cf. Wodak 2015), product and reception processes of political language and communication (cf. Klemm & Michel 2014b). Issue #3 welcomes contributions of all formats situated within the broad frame of the linguistics of politics. Papers may deal with specific aspects, or give an overview of a broader field of research. We also invite contributions focusing on theoretical and/or methodological issues. a draft outline of your contribution. Please note that the EOI will be forwarded to the (guest) editors of the respective issue who decide on the basis of the EOI whether or not a contribution will be accepted for publication. and mail your EOIs to sascha.michel@unibas.ch by 15th January 2017. Diekmannshenke, H. (2013): Chatten – Bloggen – Twittern. Möglichkeiten der Partizipation an Politik im Internet. In: Jörg Kilian/Thomas Niehr (eds.) (2013): Politik als sprachlich gebundenes Wissen. Politische Sprache im lebenslangen Lernen und politischen Handeln. Bremen: Hempen, 251-269. | Girnth, H. (2015): Sprache und Sprachverwendung in der Politik: Eine Einführung in die linguistische Analyse öffentlich-politischer Kommunikation. Berlin: de Gruyter. | Klein, J. (2008): Frames – ein Gegenstand für Semantik oder Pragmatik? In: Pohl, Inge (ed. ): Semantik und Pragmatik – Schnittstellen. Frankfurt a. M.: Peter Lang, 163-175. | Klemm, M. & Michel, S. (2014a): Social TV und Politikaneignung. Wie Zuschauer die Inhalte politischer Diskussionssendungen via Twitter kommentieren. In: Zeitschrift für Angewandte Linguistik (ZfAL) 60, 1/2014, 3–35. | Klemm, M. & Michel, S. (2014b): Medienkulturlinguistik. Plädoyer für eine holistische Analyse von (multimodaler) Medienkommunikation. In: Benitt, Nora u.a. (eds. ): Korpus – Kommunikation – Kultur: Ansätze und Konzepte einer kulturwissenschaftlichen Linguistik. Trier: Wissenschaftlicher Verlag (WVT), 183–215. | Niehr, T. (2014): Einführung in die Politolinguistik: Gegenstände und Methoden. Göttingen: Vandenhoeck & Ruprecht. | Pappert, S. (2011): Politische Sprache und Kommunikation im Wahlkampf. In: Mitteilungen des deutschen Germanistenverbandes, Jg. 58, Heft 3/2011, (= Themenheft: Sprache in der Politik. Aktuelle Ansätze und Entwicklungen der politolinguistischen Forschung, herausgegeben von Christine Domke / Jörg Kilian), 258-268. | Roth, K. S. (2015): Diskursrealisationen. Grundlegung und methodischer Umriss einer pragmatisch-interaktionalen Diskurssemantik. Berlin: Erich Schmidt. | Schröter, M. & Carius, B. (2012): Vom politischen Gebrauch der Sprache. Wort, Text, Diskurs. Eine Einführung. | Spieß, C. (2011): Diskurshandlungen: Theorie und Methode linguistischer Diskursanalyse am Beispiel der Bioethikdebatte. Berlin: de Gruyter. | Trent, Judith S./Friedenberg Robert V./Denton, Robert E. (2015): Political Campaign Communication: Principles and Practices. 8. Ausgabe. Lanham, Maryland: Rowman & Littlefield Publishers. | Wehling, E. (2016): Politisches Framing: Wie eine Nation sich ihr Denken einredet – und daraus Politik macht. Köln: Herbert von Halem. | Wengeler, M. (2003): Topos und Diskurs: Begründung einer argumentationsanalytischen Methode und ihre Anwendung auf den Migrationsdiskurs (1960-1985). Berlin: de Gruyter. | Wodak, R. (2015) Performing Europe: backstage versus frontstage politics in the European Parliament. In: Governing Europe’s spaces. Manchester: Manchester University Press, 27-55. Dieser Beitrag wurde unter Allgemein abgelegt am 19/11/2016 von Jana Pflaeging. 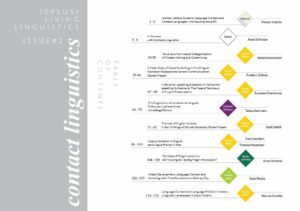 Issue #2 | Contact Linguistics | Out Now! Dieser Beitrag wurde unter Allgemein abgelegt am 19/09/2016 von 10plus1. Dieser Beitrag wurde unter Allgemein abgelegt am 23/08/2016 von 10plus1. It has almost been a year since 10plus1’s first issue „Media Linguistics“ appeared. Dieser Beitrag wurde unter Allgemein abgelegt am 24/07/2016 von Jana Pflaeging. 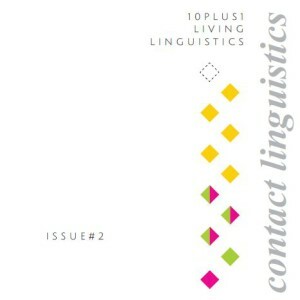 10plus1’s second issue focuses on Contact Linguistics. Research within this field is highly diverse as it encompasses a whole range of phenomena related to language contact and investigates them from different theoretical and methodological angles. Topics include changes in one or more of the languages involved in a contact situation, for example through borrowing (e.g., Thomason/Everett 2005), language creation (e.g., Schröder/Rudd fc. ), or language death (e.g., Romaine 2013), but also individual and societal bi-/multilingualism and the structural and sociolinguistic implications of these phenomena (e.g., Fuller 2012). Research may be diachronic (e.g., Schulte fc.) or synchronic (e.g., Migge 2015), deal with individual languages or multiple languages (Schneider 2003), and can consider living, endangered, or extinct languages. Issue #2 welcomes contributions of all formats (see page 1) situated within the broad frame of Contact Linguistics. Papers may deal with specific aspects, or give an overview of a broader field of research. We also invite contributions focusing on theoretical and/or methodological issues. Marion Schulte is Akademische Rätin at Bielefeld University. She studied English and Music at the universities of Siegen and Maynooth before joining Bielefeld University, where she received her doctorate for a thesis on the semantics of derivational morphology. Her research interests include morphology, language change, and sociophonetics. She is currently working on the semantic integration of borrowed morphology into English as well as the sociophonetics of Irish English. and mail your EOIs to marion.schulte@uni-bielefeld.de by 15th January 2016. Fuller, J. (2012). Bilingual Pre-teens. Competing Ideologies and Multiple Identities in the U.S. and Germany. London: Routledge. Migge, B. (2015). Now in the Speech of Newcomers to Ireland. In C. Amador-Moreno, K. McCafferty & E. Vaughan (Eds. ), Pragmatic Markers in Irish English. Amsterdam: John Benjamins, 390-407. Romaine, S. (2013). Environment: Language Ecology and Language Death. In P. Binder (Ed. ), The Language Phenomenon. Berlin: Springer, 217-234. Schneider, E. (2003). The Dynamics of New Englishes: From Identity Construction to Dialect Birth, Language 79:2, 233-281. Schröder, A., Rudd, P. (fc.). Language Mixing and Ecology in Africa: Focus on Camfranglais and Sheng. In R. Ludwig, P. Mühlhäusler & S. Pagel (Eds. ), Language Ecology and Language Contact. Schulte, M. (fc.). Language Contact in the History of English. In M. Hartner & M. Schulte (Eds. ), Migration in Context: Literature, Culture & Language. Bielefeld: Aisthesis. Thomason, S. G., Everett, D. (2005). Pronoun Borrowing, Berkeley Linguistics Society 27, 301-315. Dieser Beitrag wurde unter Allgemein abgelegt am 03/12/2015 von Jana Pflaeging. 10PLUS1 | Issue 1 out now! 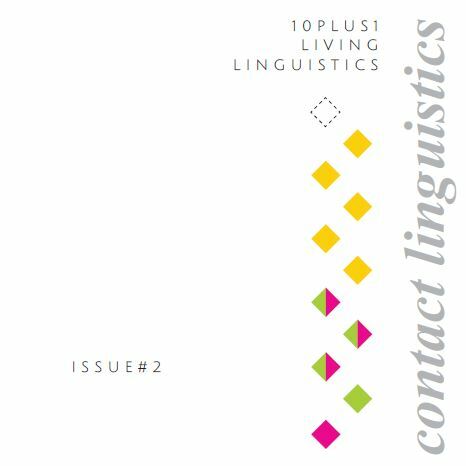 we are proud to announce the release of the first issue of 10PLUS1: LIVING LINGUISTICS. All contributions are online now inviting feedback via the comment function. We are very thankful for the tremendous support we have received along the way. In particular, we would like to express our gratitude to Jannis Androutsopoulos, Gerd Antos, Alexander Brock, Martin Luginbühl, Jan Oliver Rüdiger, Anne Schröder, Hartmut Stöckl, Jörg Wagner, the participants of the 16th Norddeutsches Linguistisches Kolloquium 2015, and all members of the 10plus1 editorial board. We hope you enjoy the first issue as much as we did editing it. Dieser Beitrag wurde unter Allgemein abgelegt am 15/09/2015 von Jana Pflaeging. In less than one week, the first issue of 10plus1 on Media Linguistics is to be released. Currently, the editors are patiently working on the final touches such as layouting, tagging, stylesheeting etc. Their work is fuelled by (a) lots of Mate and (b) the finish-line in sight! We are happily looking forward to Issue #1 – next week – 15 September! Dieser Beitrag wurde unter Allgemein abgelegt am 09/09/2015 von 10plus1. At the end of March, we presented 10 PLUS 1 at the 16. Norddeutsches Linguistisches Kolloquium 2015 in Hanover by giving a talk on „Generating and Exchanging Knowledge: Re-thinking Current Practices in Linguistics“. We received valuable feedback including a lot of praise for the project. Many members of the audience liked the unconventional formats 10 PLUS 1 offers, as well as the possibility to share ideas with others at earlier stages of the research process. Also, some colleagues even mentioned that they would appreciate more than one issue per year which we take as a great compliment. Thank you! Dieser Beitrag wurde unter Uncategorized abgelegt am 31/03/2015 von 10plus1.